And with the introduction of SAP S/4HANA and SAP Fiori, even the smallest application changes can have a far-reaching and disrupting impact on extended business processes. However, while these innovative technologies are critical for powering SAP-enabled business transformation initiatives, they can only ultimately succeed if IT departments are equipped to test and deploy them across their organization at a rate that keeps pace with today’s rapidly-accelerating applications timetable. Although businesses now expect new applications to be released at an unprecedented rate, delays in software testing are proving to be a major barrier to the success of DevOps and digital transformation initiatives. It’s perhaps no wonder that three leading analyst firms – Gartner, Forrester, and IDC – have all recognized that the way organizations address the critical software testing process needs to change. 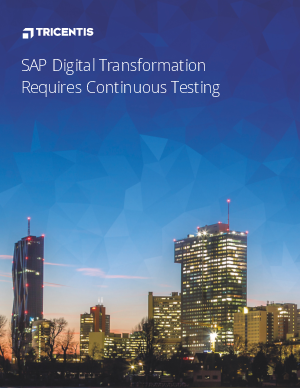 To help organizations address their SAP testing challenges, Tricentis has authored a new whitepaper – SAP Digital Transformation Requires Continuous Testing – aimed at helping organizations to reduce the burden of SAP testing. The paper sets out the software testing challenge facing today’s IT departments, and highlights the significant business risks currently faced by the 80% of SAP users that are still reliant on manual testing tools as their primary form of software testing. Read this paper to find out why manual software testing is actively holding back SAP innovation, and why – given the escalating pace of SaaS updates – it’s now time to move towards Continuous Testing for SAP-enabled business processes.